Backtracking slightly, the blog post from Saturday 18th explained the fact that it was Roy’s 70th birthday and the resulting celebrations. What we neglected to state was that the birthday got off to rather an early start. As some of you will know, Roy is an early riser (and I am not! ), and on Saturday morning someone came knocking in the door at 5.30am, I must add here that they saw the lights on in the front of the van so they knew someone was up. The chaps are Friday night regular campers who come to set a net in the bay now that the set net ban is over. They arrived at our door on Saturday morning with a sack and said, “here’s a kahawai for you”. Roy thanked them, and put the sack in a bucket out of the way to deal with later in the morning once daylight arrived. On opening the sack we got one helluva surprise, no there was not just one fish, but six! They were quickly cleaned up, and the fillets removed. We took 6 of the fillets with us to share with Steve and Leslie, the other 6 fillets we dealt with on our return on Sunday. 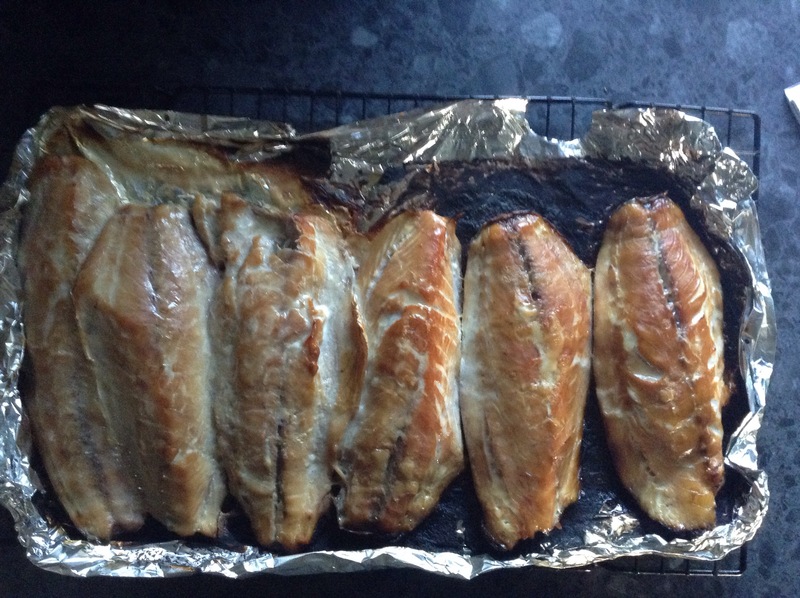 We hot smoked them as we prefer this particular fish smoked. As well, on our return to the van, we were greeted with another wee gift, there on the step was some chocolates left from some other campers we had in over the previous few days. All of theses campers had no idea that it was Roy’s birthday which, was even nicer. And it was not to end. 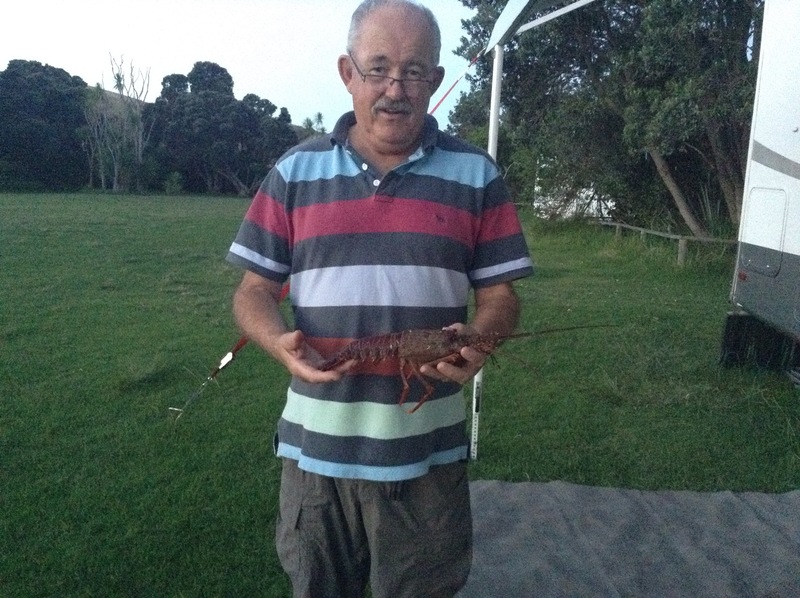 Just as we were taking the fish out of the smoker on Sunday evening, Bruce the friendly Ranger arrived with a gift of freshly caught crayfish! Nice! Crayfish for dinner it was to be. We gave some of the smoked fish fillets to a couple of young tourists to try and the rest I made into a couple of fish pies one of which made its way to the freezer for later consumption, and the remainder was made into smoked fish pâté. Tuesday we decided to put out our net out to see if we could catch anything. We had tried the the previous week but that resulted in a zero catch however this time we thought an overnight netting may be more fruitful. So the net was set, with plans to pick it up again at 6am on the outgoing tide. We retired for the evening, and we were just drifting off to sleep when Roy said “whoops, I’ve made a miscalculation, the net needs to be picked up at 2am not 6am!” You are supposed to clear the net of fish whilst it is still covered with water so that any undersized fish can safely be returned to the sea (which shouldn’t be a problem as our net mesh size means that small fish can easily escape). 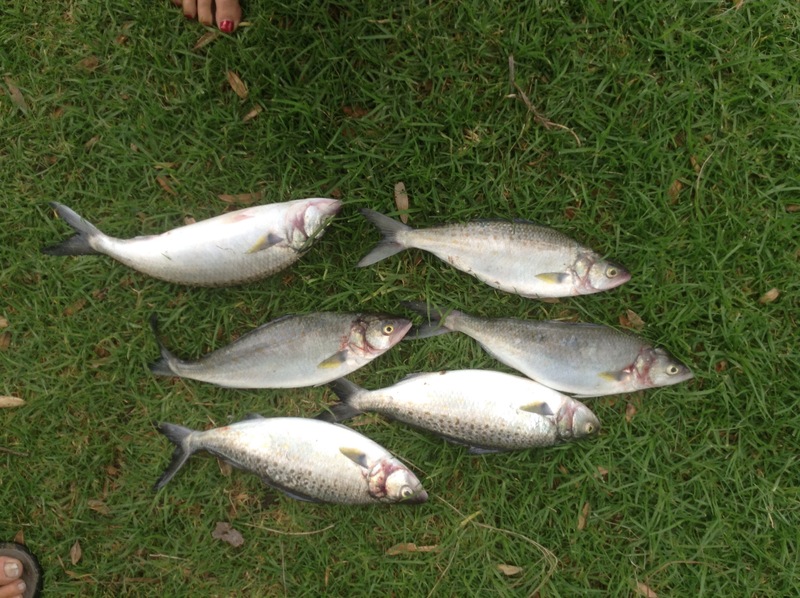 5 kahawai were caught overnight with one of them being a good 75cm in length. 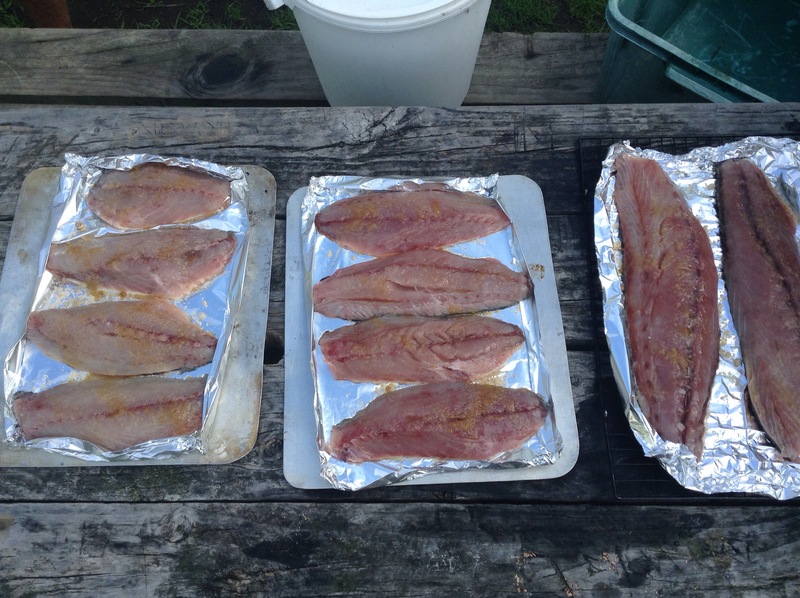 They were all filleted and smoked, with half the fish given away to the Rangers to share between them, and the rest we vacuum packed into the freezer. The net was reset with a mid afternoon pickup time scheduled. And yes, we checked and rechecked then checked again the times to make sure we had it right this time. As we were heading off to pick up the net, a family who were in staying in the camp asked if they could come and watch the retrieval process. As an aside, this is another large family consisting of 8 children ranging in age from 3 to 18, with just 6 of the children camping on this trip as the eldest two have apprenticeships and are working. All the children are home schooled, and I must say they are without doubt most pleasant, polite, bright and articulate young people. Back to the fishing, they all came along to help pull in the net and retrieve the fish, they were interested and curious about how it all workedand were most helpful. They asked if they could come and watch Roy fillet the fish. This resulted in a lesson on fish anatomy with the workings of the fish explained, from its internal organs to the gills to the different functions of the various fins and how fish eyes are different to ours. We sent them home with a large container of freshly smoked fish for their dinner, and an hour or so later, we were rewarded with some lovely warm, freshly baked chocolate brownies. There was just one more day of putting out the net, this time the catch was 3 good sized Parore and one very large stingray. The latter made a right tangle of the net and had to be cut out to be set free. The net is now off to be professionally repaired but that’s another story. Regular readers will remember that a few weeks ago I finally got round to covering the inside lid of the desk. I was quite pleased with my efforts, but after a few weeks of looking at the desk, the glove box interior I made originally started to annoy me. 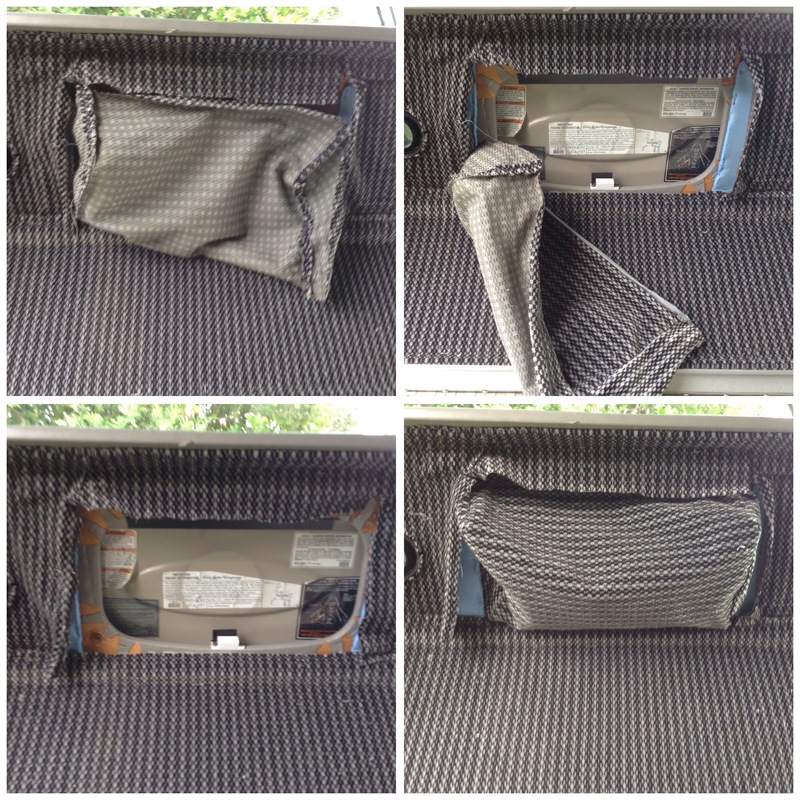 The material was inside out, I don’t know why I thought I should have made it with the right side showing only when you open up the glovebox when the desk is closed, but I did. 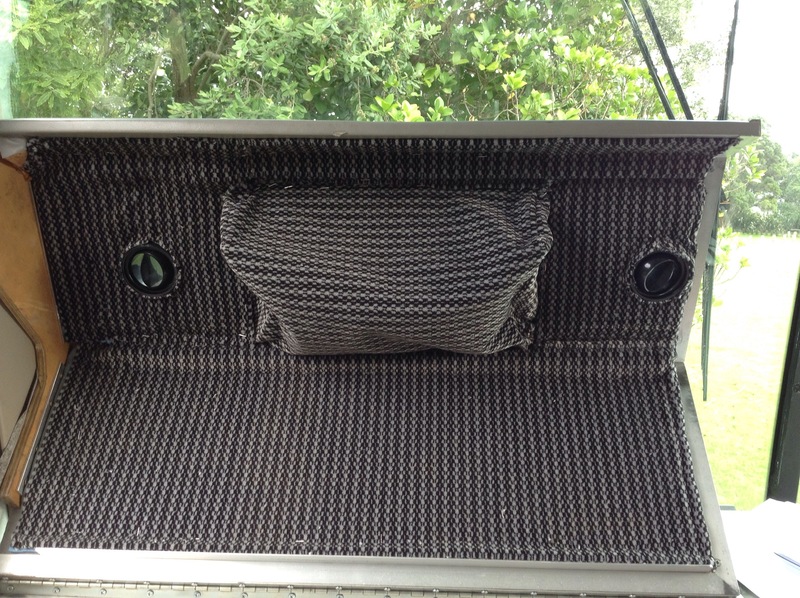 I mean, how silly, to have the right side of the material showing only when you open the glovebox. So the other day I thought I would fix it by removing it and reversing the material! Undoing all my good work and reversing the material lining. The desk put away and the glovebox view. 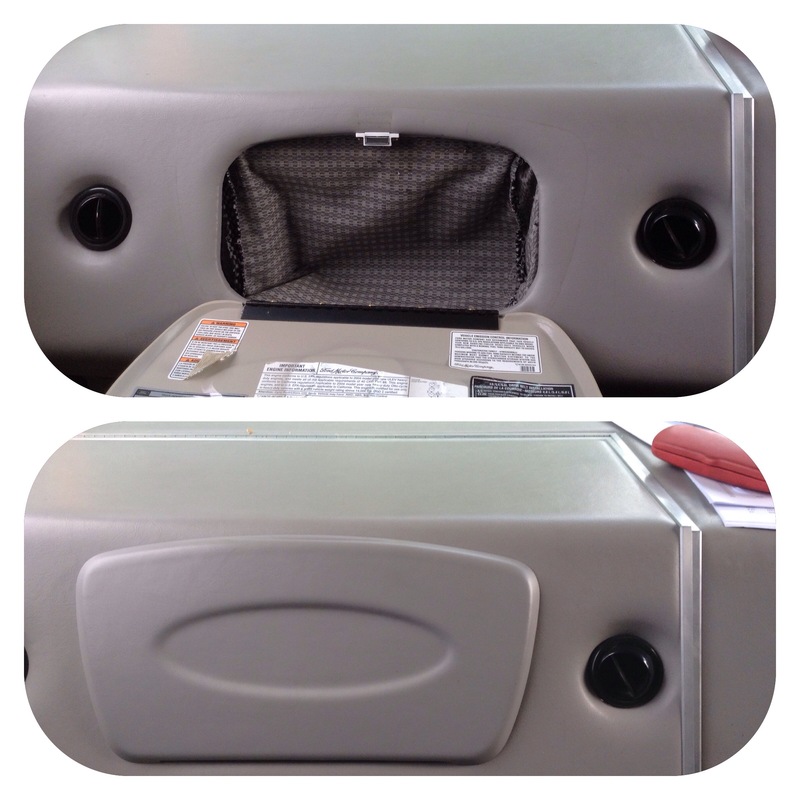 As an aside, have you ever wondered why it is called the glove box?? According to Mr Wikipedia “A glove compartment or glovebox or glovie is a compartment built into the dashboard located over the front-seat passenger’s footwell in an automobile, often used for miscellaneous storage. The name derives from the original purpose of the compartment, to store gloves. (Often in a box on the floorboard near the driver, hence Glovebox). Roy received a wonderful gift for his birthday from Alexandra and Ian. It was a bit of a family affair organising the gift, with me asking Alex to purchase the gift, Alex purchasing it and then sending it to NZ being addressed to Antony for his safe keeping until required. 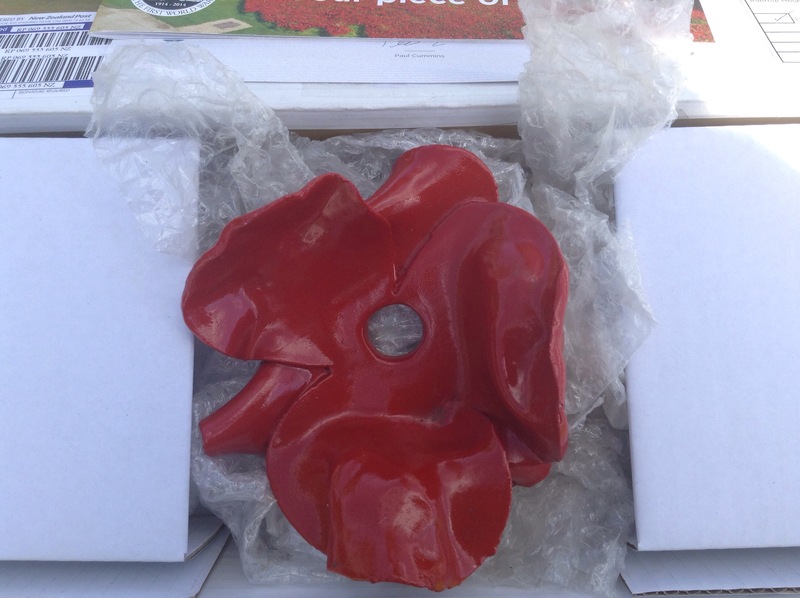 The gift was a very meaningful and poignant poppy, but not just any poppy but one of the ceramic hand made unique pieces of art. 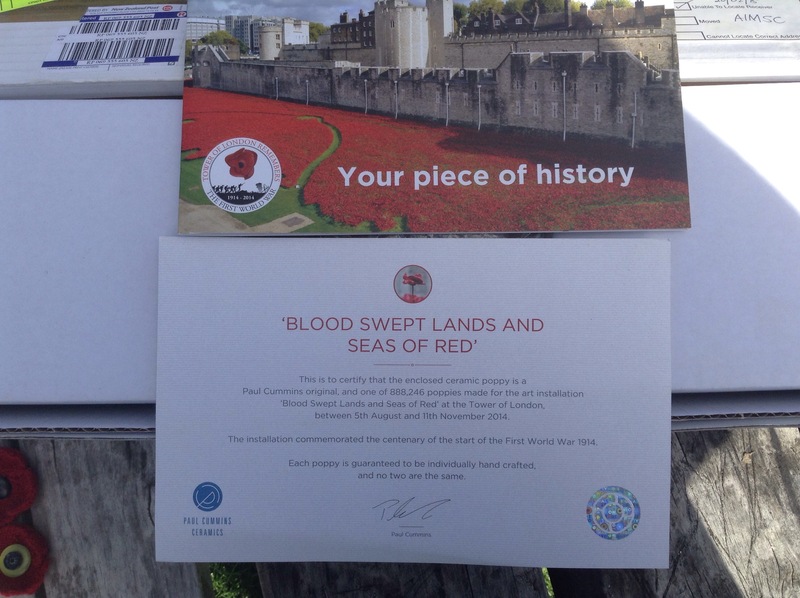 It is one of the 888,246 poppies from the installation Blood Swept Lands and Seas of Red which marked the centenary of the outbreak of the First World War. 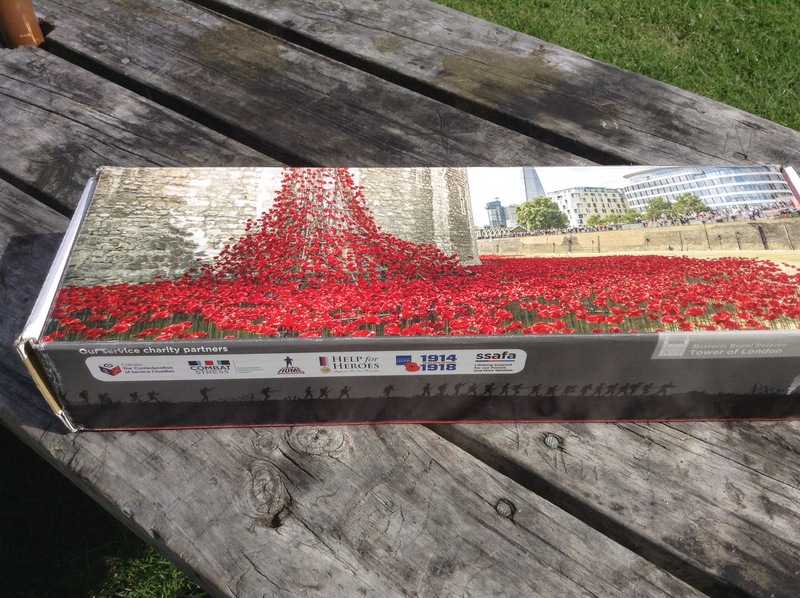 Each poppy represents a British or Colonial Military fatality during the War. Roy’s father, who was also called Roy, attempted to enlist to join the war effort before he was eligible as many many young men did. 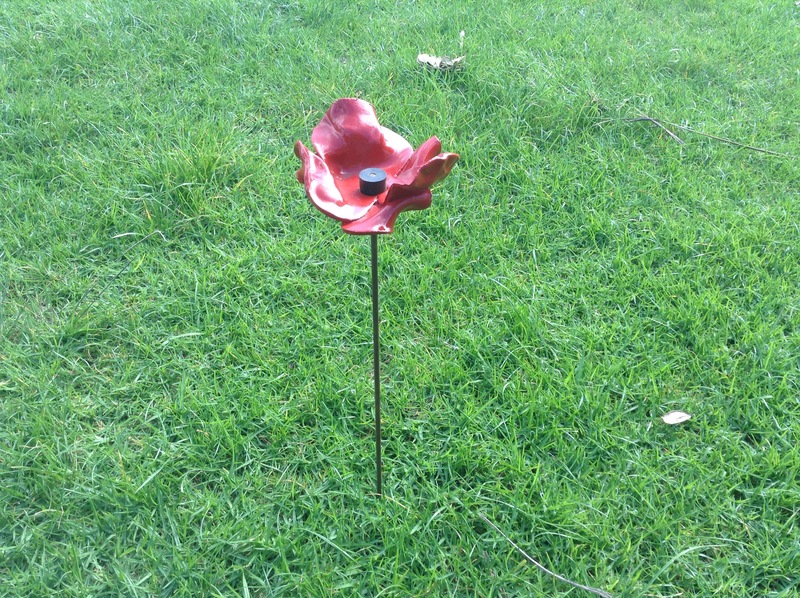 However he did enlist when he turned 18 in 1915 and embarked from Wellington 11 October 1916. His brother Luigi had embarked 16 October 1914 and was one of the many young men sent to Gallipolli, where he survived that encounter to then be sent on to France to continue fighting the war effort. Roy senior was injured at Paschendaale on October 4th 1917, and was fortunate to be invalided out of service, first to England to recuperate then returned to New Zealand. Both Roy and Luigi survived the war, Luigi died in 1960 aged 66 and Roy died in 1980 aged 83. Like most of his contemporaries, Roy Snr never spoke of his time during the war, and we have no photographic evidence of his participation. Although we do have his war medals which we have had suitably framed, these are safely packed away in storage. However, on a recent clean out of one of the many boxes of “handy stuff” we have with us, we rediscovered his regimental collar badge. 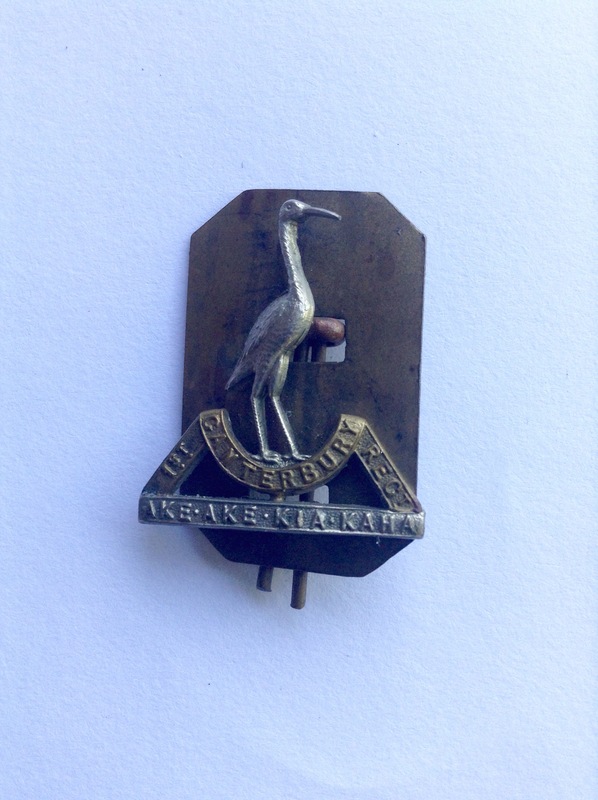 It has written on it underneath the Heron ‘The Canterbury Regt – Ake Ake Kia Kaha’ the latter of which is Maori and translates as Forever and Ever Be Strong. 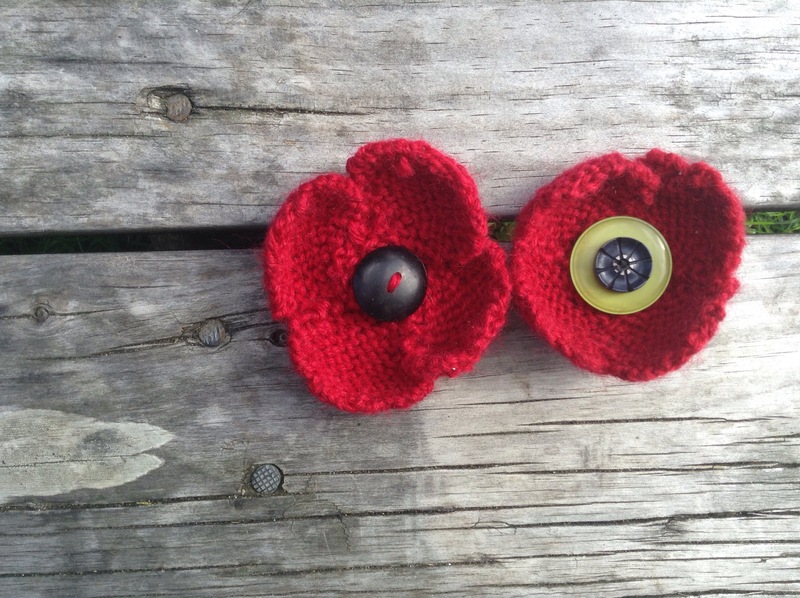 Regular readers will remember that I knitted a number of poppies as my part of the Call to Yarn commemoration Link here and I have also knitted a poppy each for Roy and I (pictured below) as well as other ones for friends and family. We wear them this week in remembrance. Roy’s 70th birthday revleries were to be a little less raucous than previous ‘0’ birthday celebrations, however, we did celebrate and celebrate well. Steve & Leslie invited us to their place for dinner with Roy’s eldest son Simon and wife Anita joining us along with our son Antony, oh and Steve and Les just happened to be babysitting their granddaughter Bea and she joined in the fun. And Alex joined us via Skype from London for a chat before the evening got started. 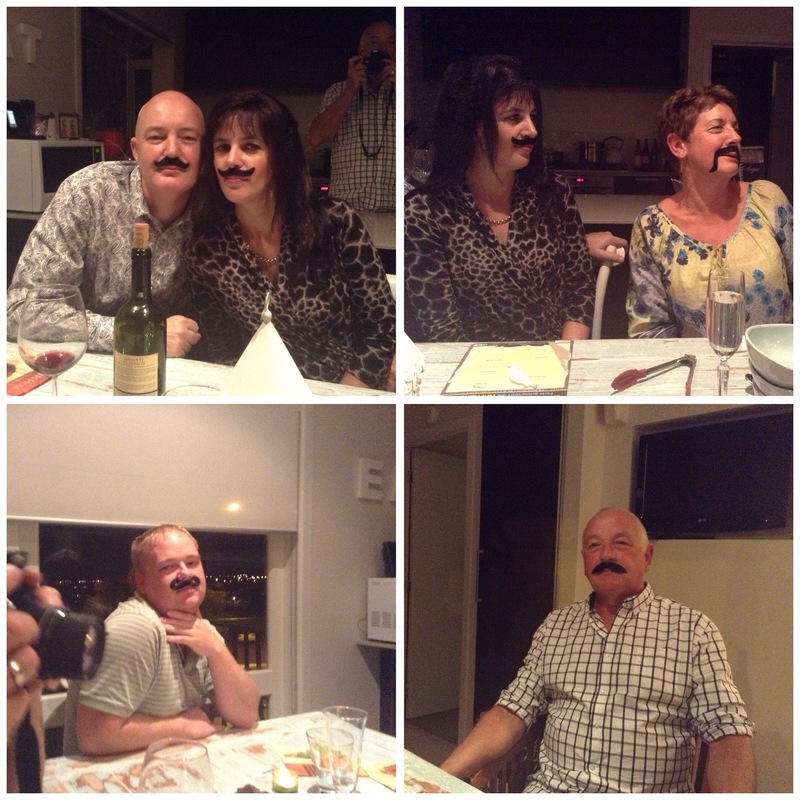 It was to be an Italian themed dinner. We were having a slow cooked Pork Ragu for the main so once that was all prepped and in the oven, Leslie and I could head out for a bit of retail therapy to gather the rest of the necessary ingredients for the festivities. 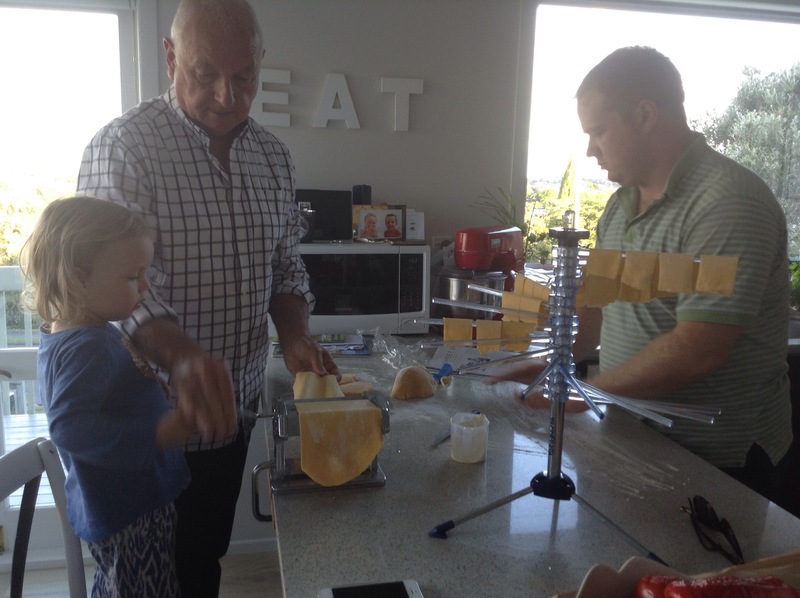 We only away for an hour or two and on our return the making of the pappardelle pasta to accompany the main was well underway with Steve getting lots of help from Antony and Bea. Once Simon & Anita arrived we were into the cocktails – an Aperol Spritz, which is an Italian aperitif that we had wonderful memories of trying when we were in Lucca although at the time we could not recall the name of it. Aperol is made of bitter orange, gentian, rhubarb and cinchona, the latter is apparently also known as quina which is one of the plants that gives us quinine. It makes for an interesting drink, quite bitter on first tasting, but something that does grow on the palate! Antipasti accompanied the drinks and these were platters of olives, sun dried tomatoes and other vegetables, Italian cheeses, salamis and other cured meats, bruschetta and the like. The main was a tender pork Ragu with the delicious pasta along with some greens. 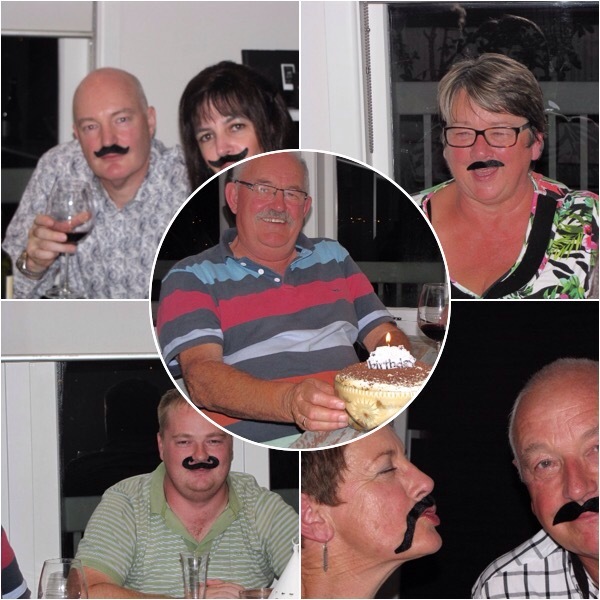 Since the evening had an Italian theme we all wore moustaches (Roy already has his own version) and speaka lika theees. 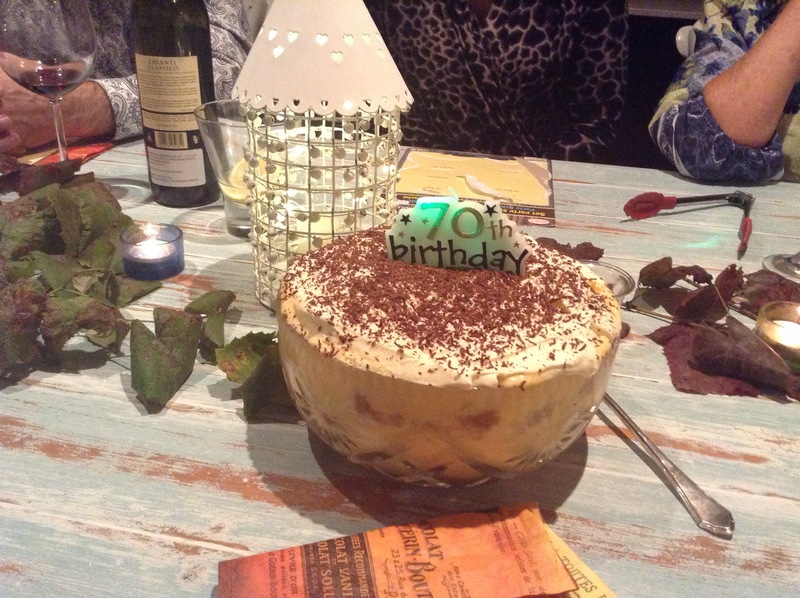 For dessert we could not go past a Tiramisu which also became the birthday cake complete with appropriate candle adornment. Just had a look though the camera card and found a few photos that deserve a view. 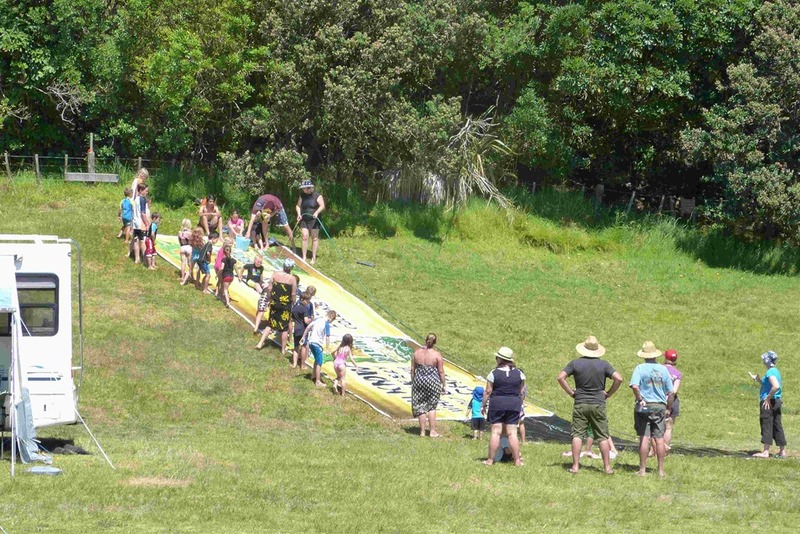 One of the entertainments at Shakespear in the Summer was this water slide which all of the children, and some of the adults, thoroughly enjoyed. These next two are from the Rally we attended at Duders Beach. 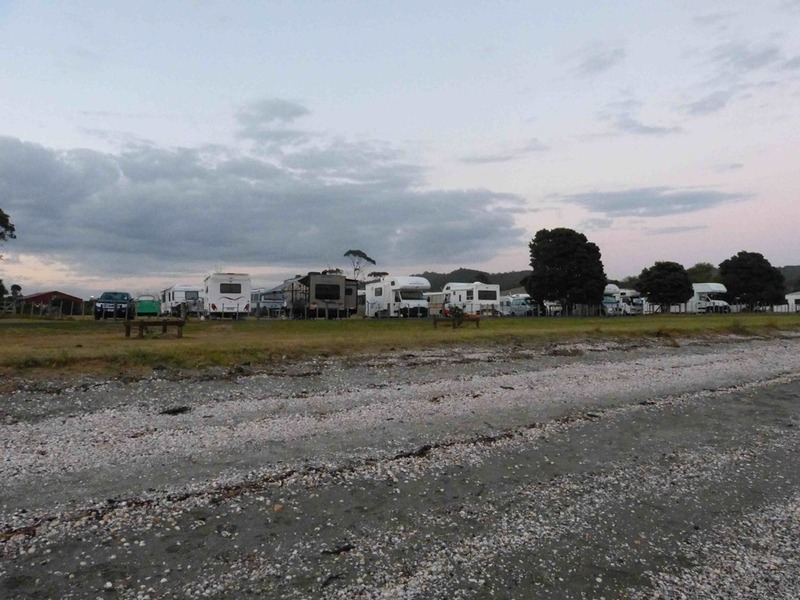 We were all parked very much on the beach front in a paddock. Adjacent to the parking area is the Duder homestead a very attractive house right on the beach. 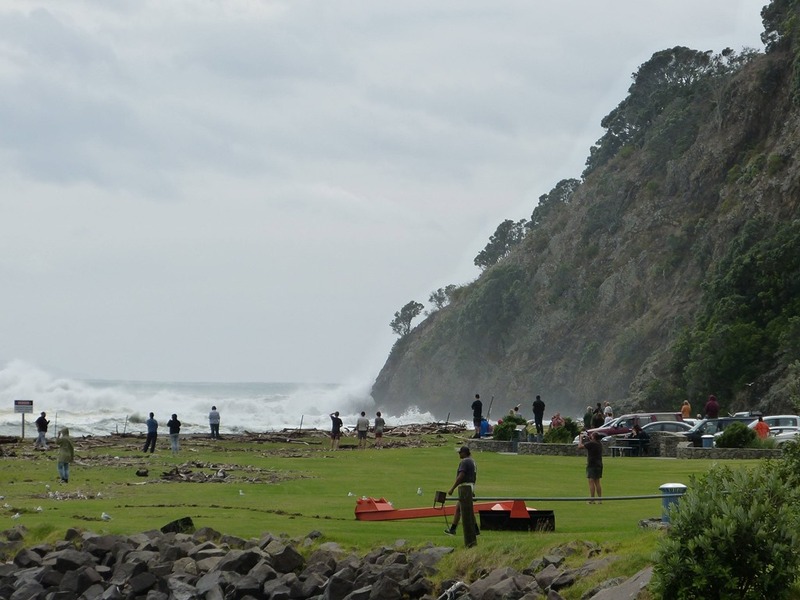 These next two show the effect of the cyclone on sea conditions at the Whakatane bar. Definitely not a day to be trying to get out to go fishing. 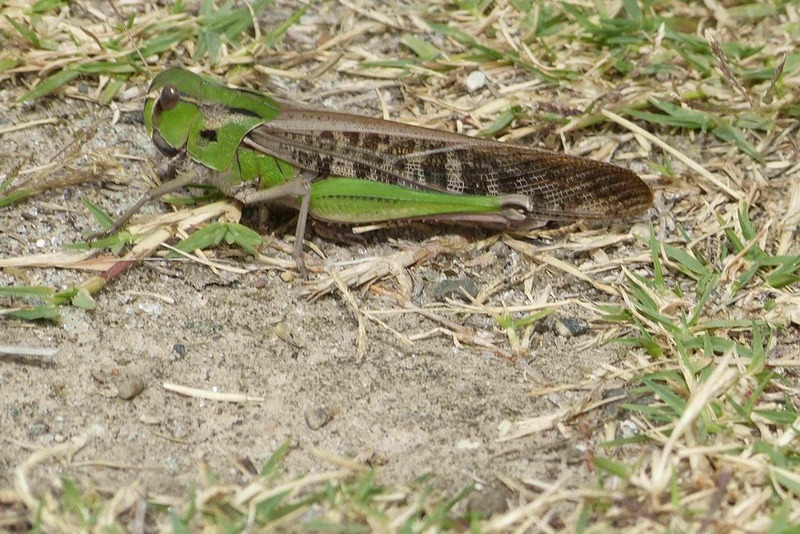 A cicada that visited us at Waharua Regional Park. It was approximately 7 cm long. And finally a photo that I thought I had lost. 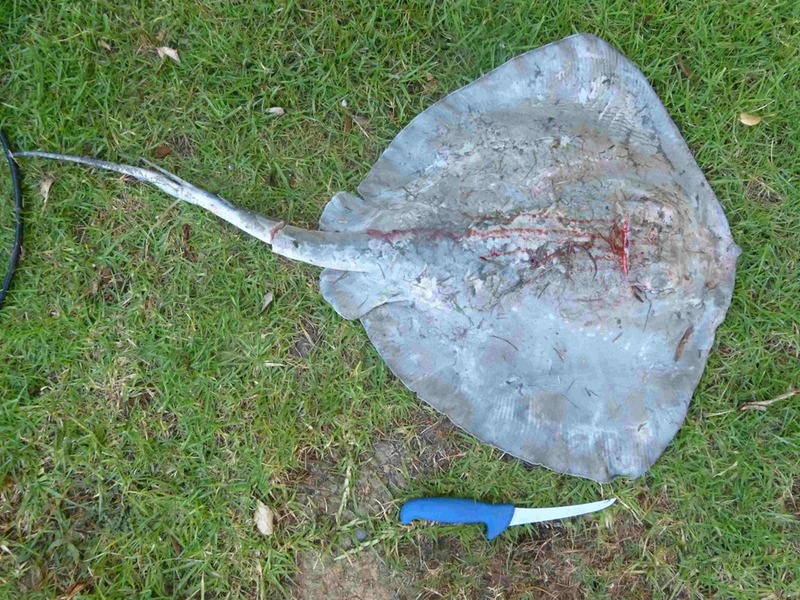 This is the stingray that we caught in the net at Kaiaua. The knife is 26cm long. I had to cut the tail off to get the ray out of the net. 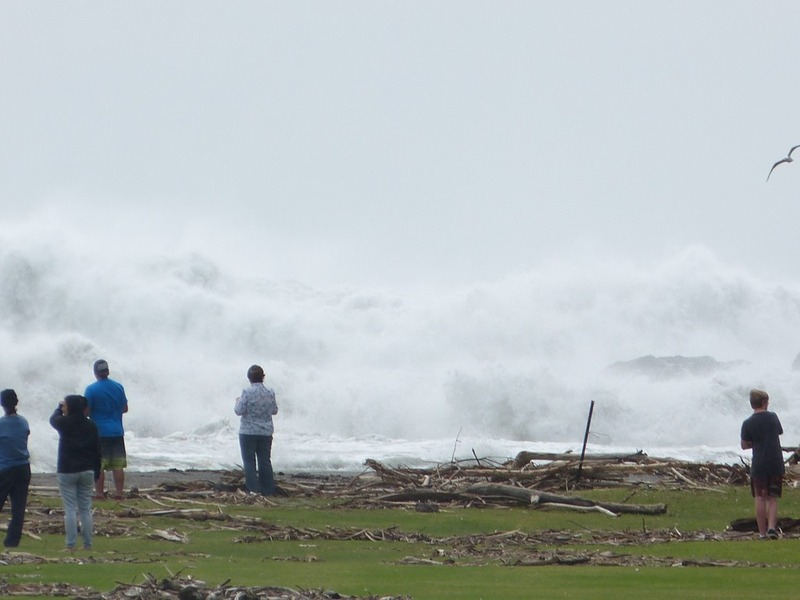 Shakespear Regional Park is an Open Sanctuary. 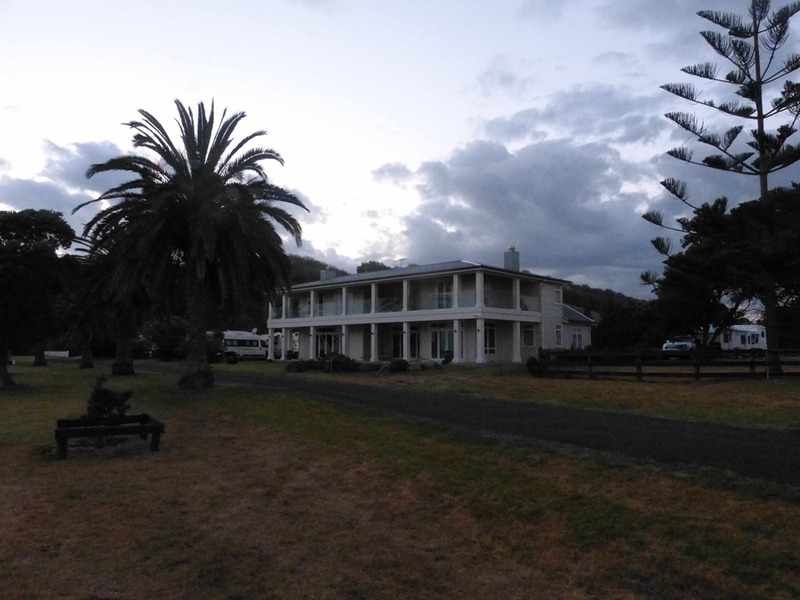 The sanctuary was established in 2010 by the construction of a pest-proof fence across the peninsula, after which all predator species were removed. An extensive and ongoing system of trapping and monitoring is required to ensure that the Sanctuary remains free of pests while allowing open access to visitors. 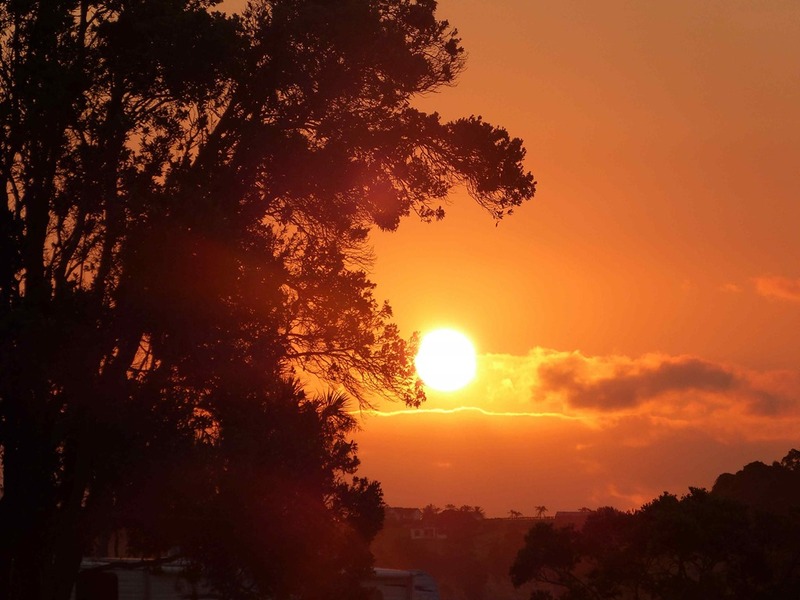 The Auckland region has ten species that are declared pests; mice, ship rats, Norway rats, weasels, stoats, ferrets, cats, possums, rabbits and hedgehogs. Although all target pests (except mice) have been removed from the Sanctuary there is a constant risk of re-invasion around the ends of the fence or through the fence due to the open public access. The fence is complemented by a system of trap-lines and tracking tunnels throughout the Park, all of which have to be checked regularly. This is one of the main activities of the volunteers as well as the Rangers, along with routine checks of the fence. 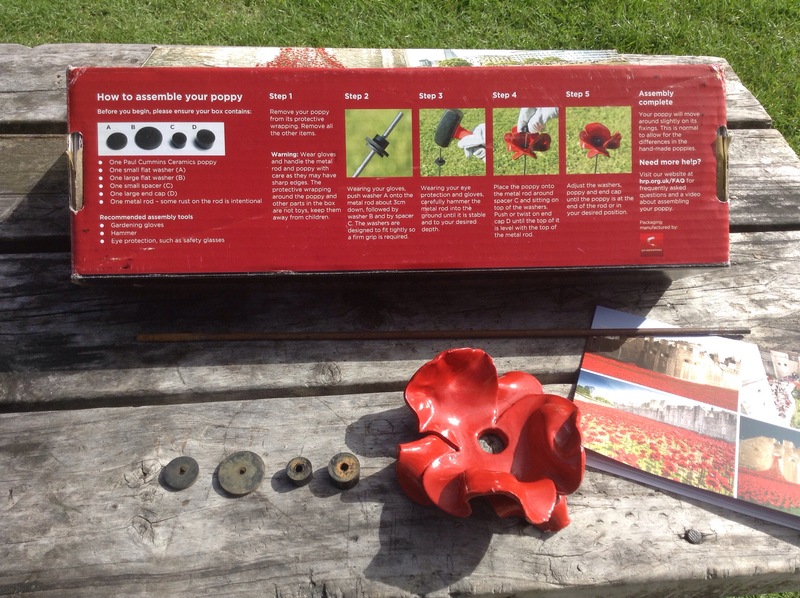 On our arrival at Shakespear Park last November, we had the task of putting out and setting the magpie traps. Magpies (Aussie imports) can be aggressive and commonly attack humans and native birds especially during nesting season and there was a ‘murder of magpies’ – an appropriate collective noun for these birds – in the Park. We had great success at trapping the birds which we then handed over to the Rangers so that they could deal with them appropriately. In the camp, located between the worm bin and the rubbish bins, there is a ‘Mouse Hut’ where campers can collect a mouse trap or two, a tunnel to place the trap inside to keep out birds, peanut butter for bait and then set up traps around your camp site. At this time of the year (autumn) the mouse numbers seem to explode. 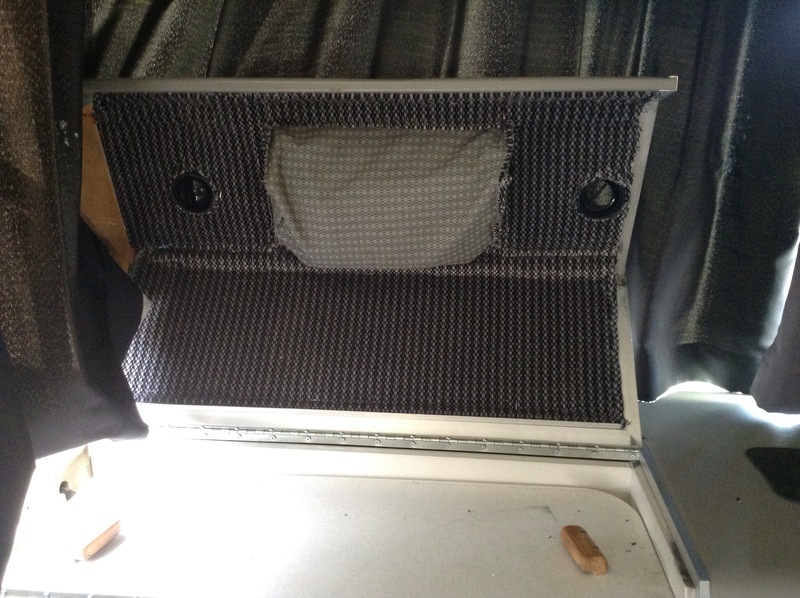 They are looking for a warm place to hide and what better place than in a campers nice warm tent/caravan/motorhome. We always have two or three traps permanently set up in hidey holes in our van, not that we have caught any mice in the past year or two, but we have had a visit from the pesky blighters in the past, hence our preparedness. With this in mind, we (and by ‘we’ I actually mean Roy!!) have set up 6 traps in the bush perimeter at the rear of our camp site, and in the past week numerous mice have ceremoniously been given the last rites!! The current count is 53 mice over 11 nights. We also have the magpie trap set so hopefully later today the pesky birds will venture into the trap lured by the cat food! Our reputation as pest controllers started last year when we were at Whakapirau at Jacky & Chris’ place when we were put in charge of the possum traps. Possums are another introduced pests – those Aussies have a lot to answer to! We proved to be rather successful at eradicating the property of a few of these Aussie imports aka pests. We shall continue to set and check traps whilst we are here, all part of our volunteering “thing”. As an aside, we have been asked on numerous occasions if our position as Camp Hosts is a paid position – the answer is it is definitely NO! We are volunteers. Roy had a piece of bacon curing in the fridge for the past few days, and it was now time to smoke and cook it. That must mean it is time to get out one of the new toys – the cold smoker. This is a totally different process and result from the usual hot smoking. The difference between hot and cold smoking is fairly self explanatory according to Wikipedia; cold smoking is a gentle drying process at around 25C, which imparts a smoky flavour but doesn’t “cook” food through. Hot smoking is usually more a way of cooking than of preserving, a sort of light roasting at around 80C to 120C. We use our BBQ as our smoking apparatus for hot smoking, as everything in the van has to have at least two uses to warrant storage space, and we can also add a third use, for cold smoking. It helps that there was an access hole in the side of the BBQ where you place a long match through to ignite the BBQ. However, it just so happens it is not only the exact right size to attach the cold smoker but it’s also in the perfect place. The smoker was attached to the side of the BBQ a and filled with some Manuka wood chips before being set alight, the smoke is pumped into the BBQ without any heat. After and hour or so the bacon is done and then ready to be cooked slowly in the oven. Then the next new toy comes out – the electric slicer! We bought this one after seeing and using John’s one whilst we were in Whakatane, we figured that we could very easily justify its use. The bacon is all perfectly and evenly sliced before it is packaged up and yes, you guessed it the next new toy is put into use – the vacuum sealer. Next is the turn of the Pastrami. First the meat has its coating of carefully selected and ground spices rubbed all over it and then it is left for a day or two. The next step is to put the meat into the cold smoker for a gentle smoking before it is then steamed to cook it. We use a thermometer to test when the internal temperature has reached the desired level so we know that it has been cooked properly. Once it is cooled, we slice it up and vacuum seal it into portions for later use. Mmmmm, delicious! We also smoked a couple of pieces of salmon for our dinner, but this time it was using the hot smoked method. With a chilli glaze on it, it was done in a short time, delicious for our dinner served with a creamy mustard mash and braised baby peas and greens. Thursday morning we headed off from Shakespear down to Papakura to Antony’s to help him reupholster some dining chairs that he had recently purchased via TradeMe. But first we had a few chores to attend to which required a couple of stops along the way. The first was to stop in Silverdale to pick up our repaired, welded piece for the kitchen corner cupboard. That was quickly done and we were on our way again, fortunately with fairly free flowing traffic all the way which is more than the poor people stuck in very slow moving northbound traffic. Then it was to Takanini to pick up a couple of pieces ready to do the upholstery. Now I have no experience in upholstery, the only attempt I have previously made at upholstery is the covering of the headboard and desk top, hardly what I would call vast experience. Never mind, it surely cannot be that hard and there is always YouTube to call up for instructional tutorials. The chairs did not have removable seats, so it was going to be a fidly job. We had purchased the material the other day, and had a staple gun and scissors – what more tools could we possibly need? Oh yes of course, we have to remove the old material from the top and the base. This involved removing a gazillion million staples! You think I am kidding? I can assure you that whoever had done the work previously must have had shares in a staple company!!! We tried many ways of removing the staples, but after many trails, grunts groans and injuries, the best method we found was to use a small screwdriver to lever up the staple, then remove the staple using pliers. It was not going to be a quick job. We started work at around midday, and the last staple went into the last chair at just after 8pm. I can assure you that my right hand is still aching two days later from the effort but I have to say we are thrilled with our handiwork and they look fantastic. First we removed the backing material covering the base, so we could access the main material which was stapled to the underside rail of the chair seat. Once all material and staples were removed we then recovered the seats with more foam, then by using the removed material as a pattern, I cut out the seat covering. Of course I cut out one for a start to make sure that it was correct before continuing to cut out the remainder. Once we got into the swing of things, it did not seem to take too long at all. Only one hitch though. We had purchased a staple gun to get the job done only to discover that we could not get a further supply of staples – no, not even from the hardware store selling the original purchase. Not to be put off, Roy purchased another staple gun from another store, this time complete with a box of replacement staples. 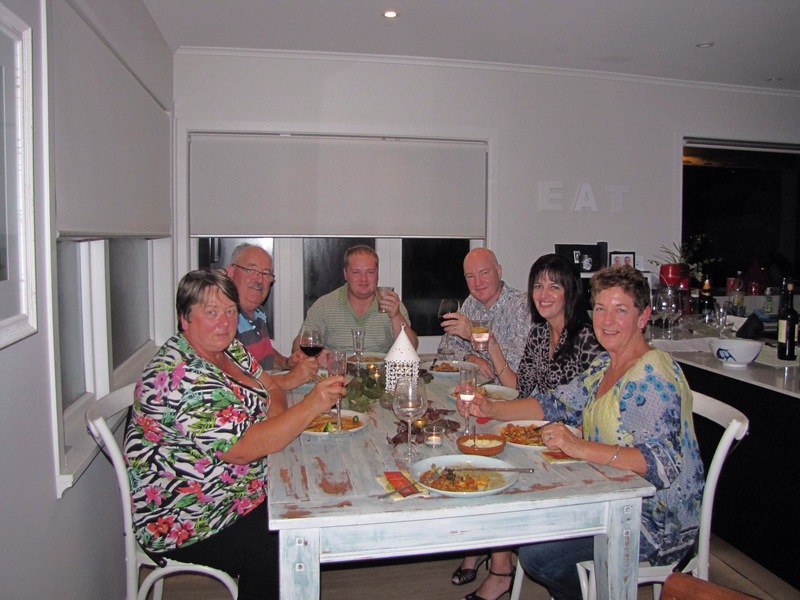 The job was completed in time for us to try out the table and chairs as Antony cooked us dinner – surf & turf (steak and garlic prawns) and a delicious salad to accompany it. A great end to a busy day. We arrived back at Shakespear before the crowds arrived for the Easter weekend. We set ourselves up back in our usual position except this time we did park further forward so that we are not in the shadow of the trees during the day. Parked up. Easter weekend arrived and so did the campers, with a full house in over the weekend. We were fortunate too that the weather remained calm and dry over the whole weekend which always makes for happy campers. We did manage to get some fishing in, although we do admit that it was ‘Vannini fishing’, which means that we we given the fish by some lovely campers. This time though the fish came already cooked, hot off the BBQ a whole BBQ’ed snapper which we enjoyed for dinner. We were also fortunate to be given Easter Eggs from some grateful campers, they were enjoyed by us both. The weekend was also pickle and relish making weekend, with Roy making his Chili Tomato Chutney and I made a batch of Tomato Kasundi as well as a Red Pepper & Tomato Relish. Earlier in the week, Steve had given us some chilies and some beetroot from his garden, the chilies were used in the relishes and I also made a delicious beetroot chutney. The cupboards are now full of pickles, chutneys & relishes which will see us well supplied through to next year. After the crowds left us, we ventured down to Albany for the day on Tuesday to do a bit of shopping as well as catching up with Antony who was up visiting his cousin Sarah. We also called in to an Engineering firm in Silverdale along the way so we could get a small piece of pipe repaired and welded. This was a repair to the kitchen corner turntable unit which had developed a slight lean, we will pick up the repaired piece in a day or two. It is nice to be back at Shakespear, although I can not say the same for the end of Daylight saving. I am certainly not enjoying it getting so dark so early in the evenings, it seems we are inside far too early in the evenings.